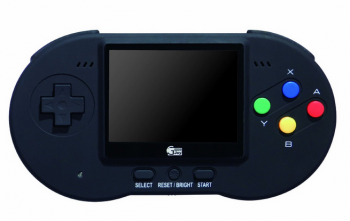 The Poke Fami DX is a portable SNES with a 3.5 inch screen and TV out. The Retron 5 is the retro-gamer's console of choice, playing retro games from nine different systems. But what if you want to play your retro titles on-the-go? The Poke Fami DX, a portable SNES, might be the right choice for you, and some upcoming adapters will allow you to play Famicom (Japanese NES), Genesis, and GBA games. The Poke Fami DX has a 3.5 inch screen and a TV out, so you can still use it as a traditional SNES emulator if you want to. An adapter lets you plug in a second controller for multiplayer Street Fighter 2 or Mario Kart action. A GBA adapter is scheduled for release this summer, and adapters for the Famicom and Mega Drive (Japanese Sega Genesis) will be available soon too. The system measure out to be 18 (width) x 9 (height) x 4 (depth) cm and weighs 320 grams. Included in the package is an AC adapter, controller connector, stereo AV cable, stand, cleaning cloth, and the system. A lithium battery powers the system when you're on-the-go, which boasts around 7 hours of play. Adapters for other hardware like the Famicom, Mega Drive, and GBA are sold separately, and from the looks of things the console and its adapters are only available on Amazon Japan or other specialist retailers. It looks like English language games work with the base SNES model of the console, but it is unknown if they will work with the new upgrades. As far as I remember, the NES and Famicom cartridges are completely different, so we can probably rule that one out, but GBA carts are the same across both regions, and i'm not sure about Mega Drive vs. Genesis.